A trophy-less campaign for the Southampton outfit, but a last-day escape maintained their Division One status. It all came down to the final day. The season would be decided by its outcome: success or failure. Hampshire had been looking over their shoulder at the looming spectre of relegation all season, now they would find out their fate. Having gambled to try and force a win against Yorkshire and lost the week before, things were not looking particularly bright. 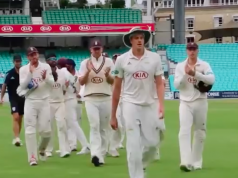 They travelled to Trent Bridge to try and end Nottinghamshire’s seven-game unbeaten run and hope that Sussex succumbed to the Champions’ promotion party at Headingley. So far the season had been a struggle. It had been defined by a shaky top order and a bowling attack that often lacked penetration. They had lost to bottom side Worcestershire. They had drawn many matches they could have won. Disappointment reigned. Previously dependable Division One performers were lacking form. However, wins against Durham and Warwickshire offered hope. Fidel Edwards had looked ferocious and deadly with the new ball – the cutting edge that had been lacking for the majority of the season. His stump-splaying prowess and 16 wickets gave Hampshire an outside chance, as did James Vince’s long-awaited first Championship hundred of the season. Team spirit and belief was not lacking. In the event it was the fairy tale ending. Edwards had obviously read the script and proceeded to decimate Nottinghamshire’s batting line-up, taking 10 crucial wickets. He was backed up by gritty contributions with the bat to give Hampshire a remarkable 8-wicket win. But they could not celebrate just yet; attention turned to Leeds. Hours later Yorkshire completed their part of the bargain. Hampshire had survived: The great escape was complete and with it their season was a success. 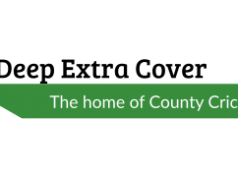 The Southampton-based club are known for their short format specialities, but it was the County Championship which held most significance. Promotion from Division Two was well deserved – this season’s challenge was to stay there. Ultimately, when it came to it the big players whose form has gone missing for large parts of the season turned up. The three wins in the final five games contained Vince’s first hundred, Michael Carberry’s finest form, Edwards’ aggression and valuable wickets from late addition Ryan McLaren. If players of this calibre had hit the ground running, where would Hampshire have finished? They certainly wouldn’t have required such a dramatic ending. Elsewhere the other two formats contained less drama – more the consistent, professional progression we have come to expect from the side. Another Finals Day was reached through the tried-and-tested method of explosive batting and tight bowling before a disappointing exit to Lancashire at Edgbaston. The One-Day Cup was a similar fare, with Hampshire making it out of the group before losing to eventual winners Gloucestershire. While Vince battled for form against the red ball, he led from the front against the white one, displaying fluency and brutality with the bat and tactical nous as captain. While no silverware may be a slight underachievement fans can still savour individual performances in the shorter formats and an unforgettable season finale. It’s hard to argue with the consensus. Gareth Berg was voted supporters’ and player’s player of the season and the all-rounder certainly worked hard for his award. There were obvious concerns when the club announced the signing of a 34-year-old with a history of shoulder injuries, but Berg has stayed fit and performed admirably throughout a tough county season. In total he bowled a heroic 442 overs, maintained a miserly economy and contributed some vitally important runs. There has been a great deal of excitement surrounding Mason Crane, and with good reason. The 18-year-old legspinner progressed quickly from virtual unheard-of to the youngest ever Hampshire player to take a first-class five-wicket haul in the Championship. Across all three formats Crane took 23 wickets, but it is his rapid adaption and the rarity of his talent which has seen him called up to the England U19s and Development Programme. Certainly one for the future. A brief glance across the team’s batting averages gives you a snapshot of the problems faced in Division One. The higher quality of bowling meant that every one of the top six struggled for consistency. The whole team managed just five hundreds in the Championship, with only Carberry passing 1,000 runs for the season. The opening partnership, once a foundation on which to build on, regularly struggled to get going. After a superlative last season fans have grown accustomed to lumbering Vince with the burden of run scoring and his stop-start season in four-day cricket was therefore a disappointment. Overseas players can make a huge amount of difference. Hampshire recruited various capable cricketers over the course of the season, but none proved be to a mainstay of the side. Jackson Bird suffered injury setbacks, while Yasir Arafat performed well in the T20 Blast. However, if Hampshire are going to become a regular fixture in the top half of the Championship an overseas player who is capable of playing the whole season, preferably across formats, could be the key. Fidel Edwards was undoubtedly a success – his wickets proving absolutely vital in Hampshire’s great escape – but his mid-season disappearance to the Caribbean Premier League, on reflection, could have been costly. The West Indian fast bowler has signed a new deal and will be important next season. Sixth Finals Day in a row, a One-Day Cup quarter final, but ultimately it all hinged on the final day on the County Championship. A miraculous and memorable escape has left a wholly positive aura for 7/10.